Abraham Tarbei signed off Kenya’s medal hunt for Paralympic medals on track with a Bronze on penultimate day at the Olympic stadium in London. Tarbei who won the gold in the 1500m T46 classification crossed the line behind Austrian Gunther whose 1:52.81 was a new world record in the two lap race while Algerian Samir Nouioua was timed at 1:52.33, an African record. The Kenyan ran his season best of 1:53.03.Compatriots Johan Chesum(1:56.57) ranked sixth ahead of Stanley Cheruiyot(2:03.78). Mary Nakhumicha,33, wrapped up her field events also on Saturday with a throw of 7.70m that placed her 13th in the women’s 57/58 classification Shot put behind Mexican Angeles Ortiz, who set a new world mark of 11.43m. She also failed to clinch a medal in the javelin two day’s earlier where with her improved throw of 16.86 her season best again ranking her 13th overall. Chinese Ming Liu was the gold winner in 23.48. Despite not winning a medal in London, Nakhumicha as she was chosen by the International Paralympic Committee for the Whang Youn Dai Achievement Award. The Kenyan and Ireland's Michael McKillop.were chosen as the athletes who exemplified the best spirit of the Paralympic Games, and they will both receive a gold medal at the London 2012 Closing Ceremony on Sunday (9 September), which will be presented by IPC Vice President Greg Hartung and Dr. Whang Youn Dai. 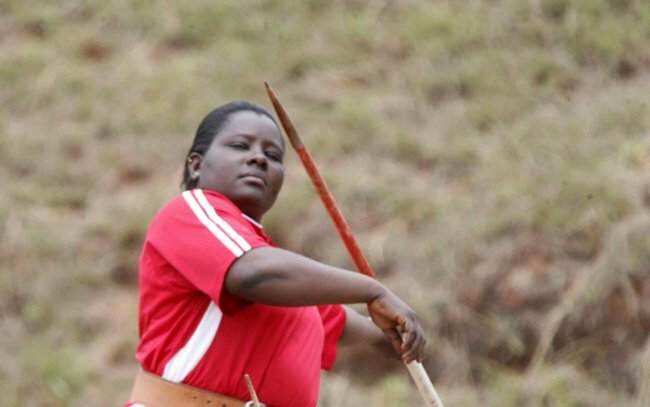 Nakhumicha, who competes in javelin and shot put F57, has helped changed the face of Paralympic sport in Africa. "Because of my success in field events more women with disabilities in my community and in Kenya have shown interest in sports," Nakhumicha said. "People with disabilities, especially women are now getting involved in sports not just in athletics and field events but also in other sports as well like wheelchair basketball and sitting volleyball. "The Paralympic Movement is spreading in my country and opens opportunities for people with disabilities and help change the perceptions towards people with disabilities in a positive way." McKillop, who lit up the Olympic Stadium in London with gold-medal winning races in the 800m and 1,500m T37 events, consistently dedicates time to helping and encouraging thousands of school children throughout Ireland. Thirty-nine participating countries nominated 58 athletes for the award, for which the Whang Youn Dai chose the finalists and the IPC chose the winners from there. The other male finalists were Egypt's Sherif Othman and South Africa's Oscar Pistorius, and the other female finalists were Great Britain's Di Coates and Spain's Teresa Perales. The final two winners were chosen by an independent panel of judges comprised of Hartung and two IPC Governing Board members, Rita van Driel and Ann Cody. The mission of the Whang Youn Dai Achievement Award is to enhance the will of people with an impairment to conquer their adversities through the pursuit of excellence in sports and through the Paralympic Games. These two winners have shown exceptional qualities that represent this award.